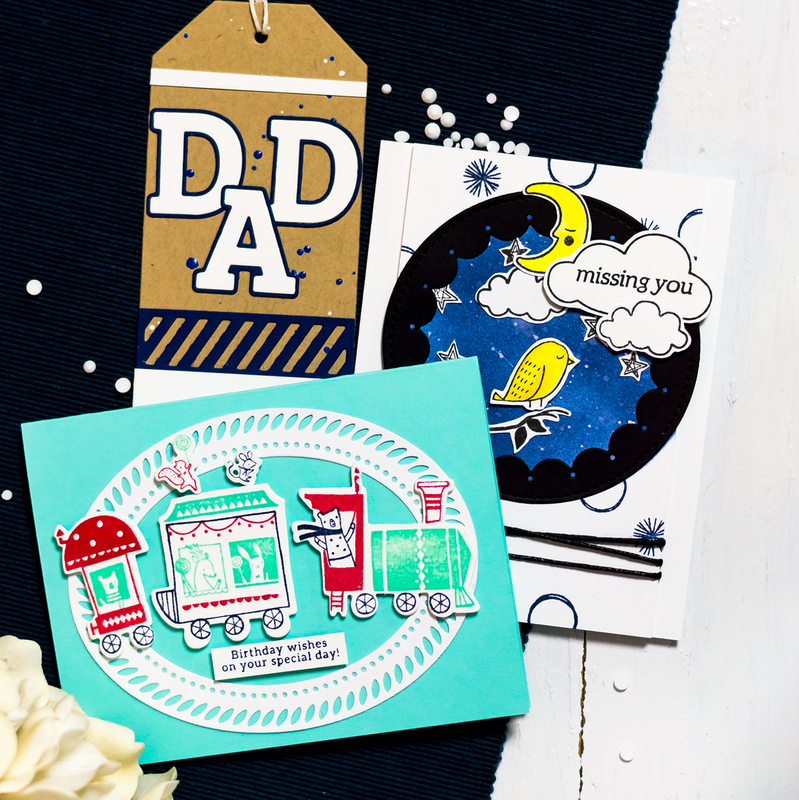 Today is a happy day of new Simon Says Stamp release – Best Days. 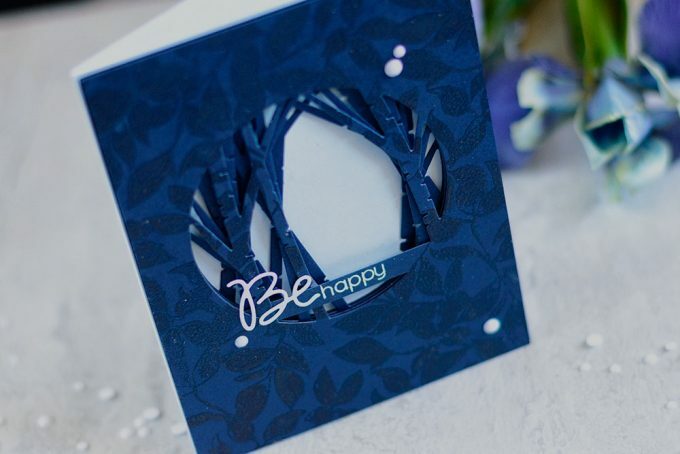 I was lucky to be able to play with one product from the release – Birch Circle Die. And today I want to share three ways this die can be used (although there are much more of them). The idea of such design have been in my head for quite a while – a tunnel of layered rotated one along another die-cuts of a window or frame. I just needed a right die to realize it. And this die perfectly fits the bill. I used three panels of Navy cardstock to create the tunnel. 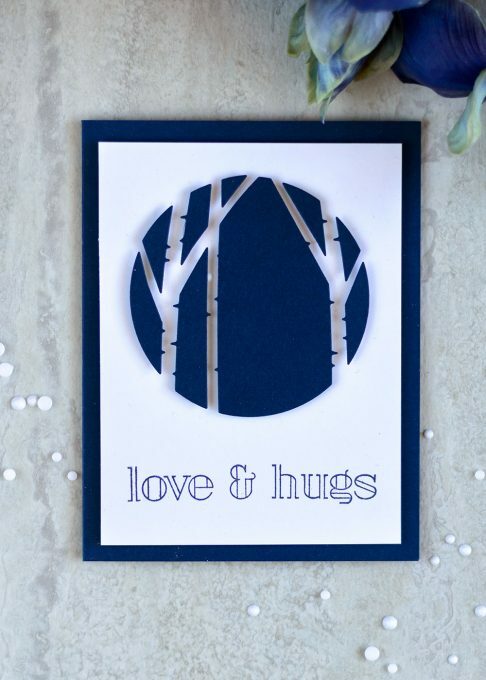 I die-cut the birch circle window out if each in the same spot. For the front panel I placed the die vertically straight, for others I rotated it a bit. 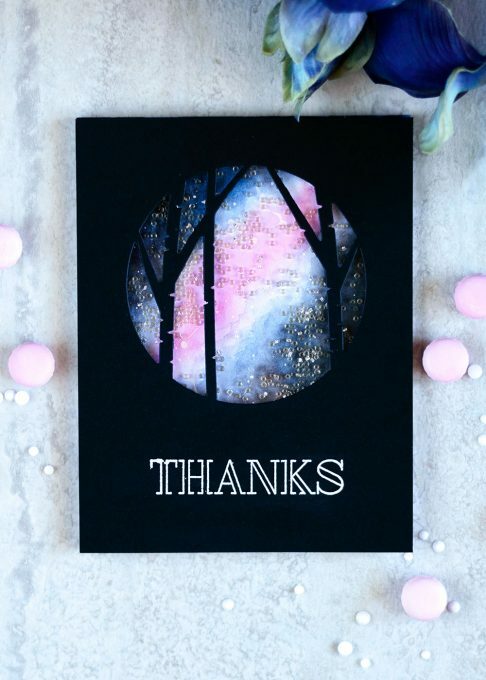 To achieve this look of layered trees. 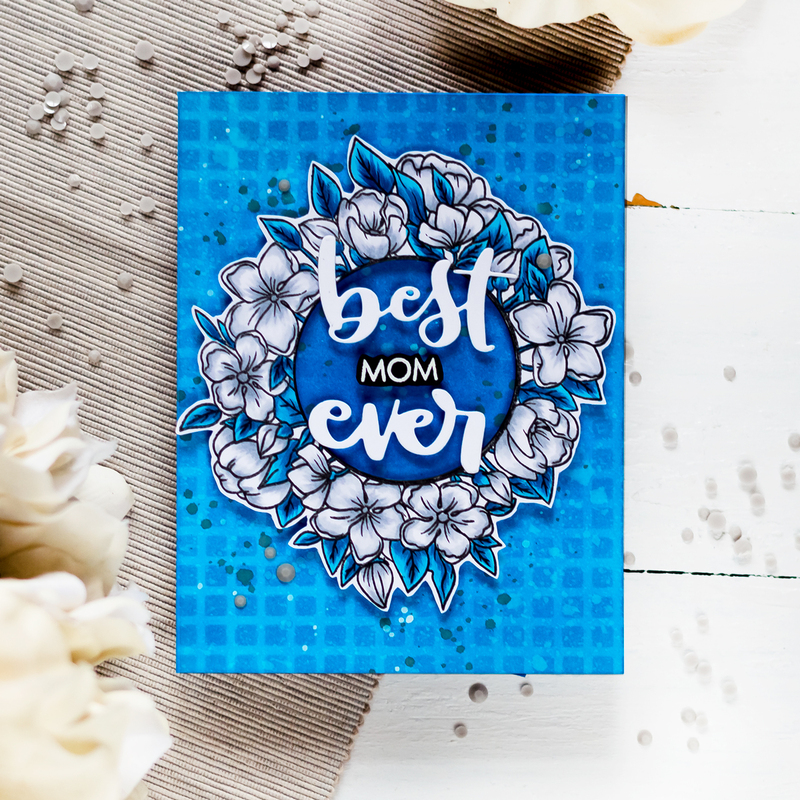 I wanted to add some interest to the front panel and embossed SSS Leaves Background onto it using Wow Matte Clear Embossing Powder. There are some products, which I write a long passage about every time I use them. Usually these are products which are not very widely used, but which I consider as must haves in any craft stash. And this Matte powder is one of those. I love not shiny and a bit textured look it creates. 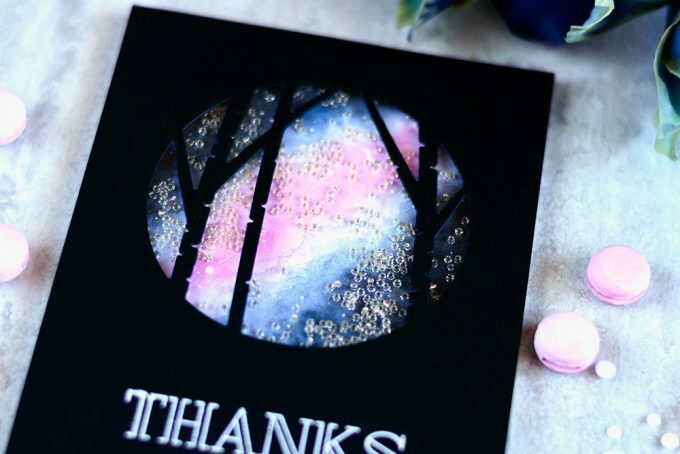 Totally different from regular clear embossing powder, which is usually shiny and slick. Don’t get me wrong. I love regular clear embossing as well. But sometimes situation calls for something more settled. I made a card base out of Bazzill Icy Mint cardstock and foam mounted all panels onto it, layering one on top another. 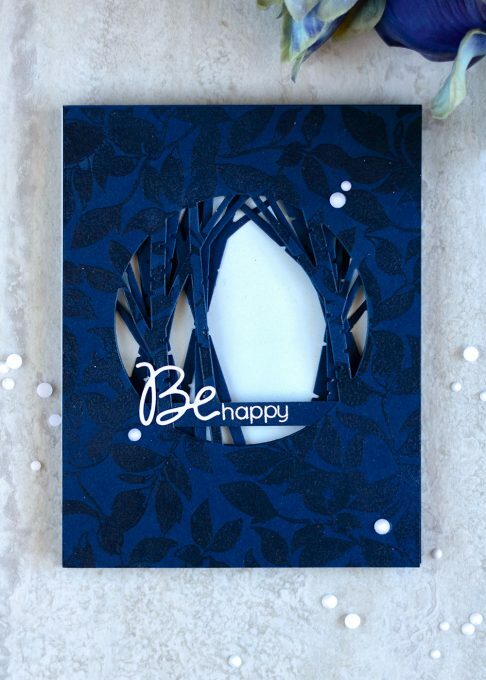 I used black THIN foam squares for this task. And this is another product I believe everyone should have. First of all black squares themselves are must haves. Sometimes having white ones peeking out from underneath of dark card element can spoil the whole card. Maybe it’s just me and my OCD, but I cannot allow it on my cards lol. I would even prefer to have them in all rainbow colors. Or at least in kraft. 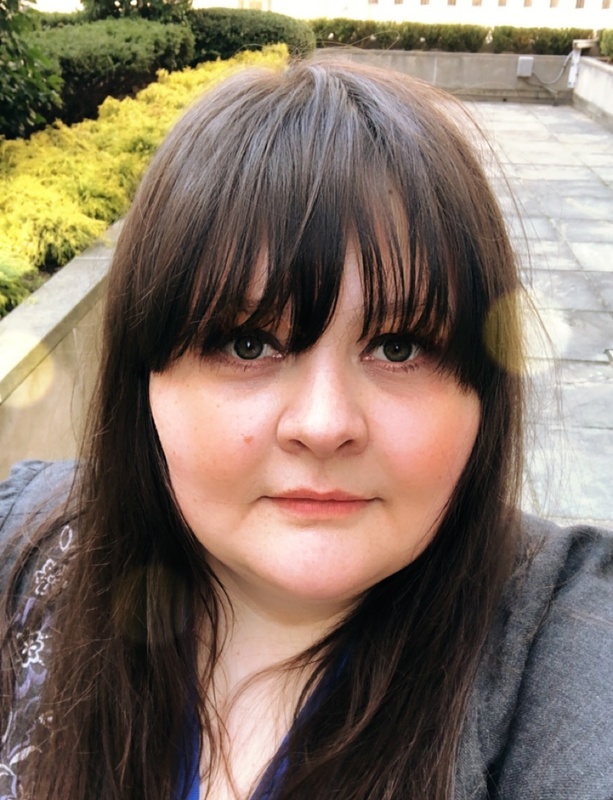 Next the thickness – I’m a big fan of thin ones. They’re somewhere twice thinner than regular ones and sometimes less thickness is required. In this case if I layered all panels using regular foam the card front would look rather like a thin box lol. Thin one gave me ability to still pop them up, but not too much. Moving on! 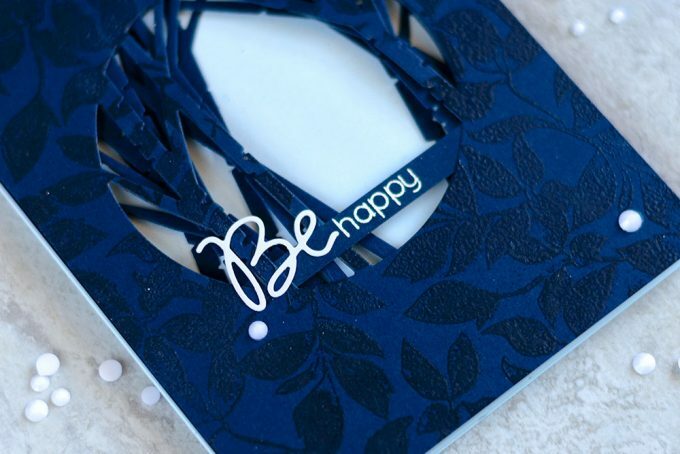 I white embossed happy word from SSS Be Sentiments Stamp Set onto a stripe of Nave cardstock and stuck it under the top panel. Followed by adhering Be die-cut before it. 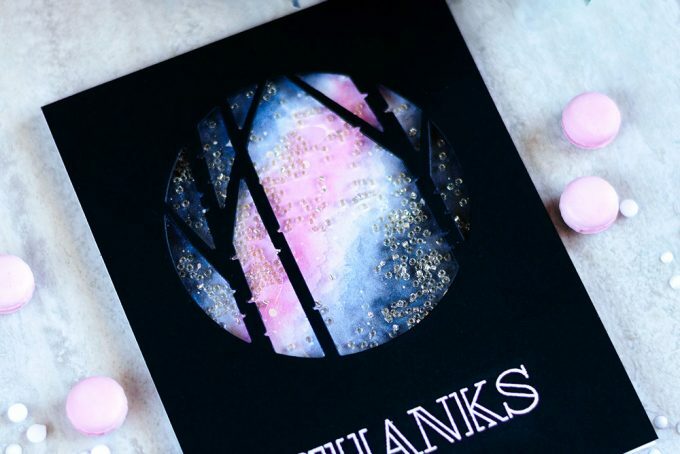 To finish off the card I added several Snow Crystals. 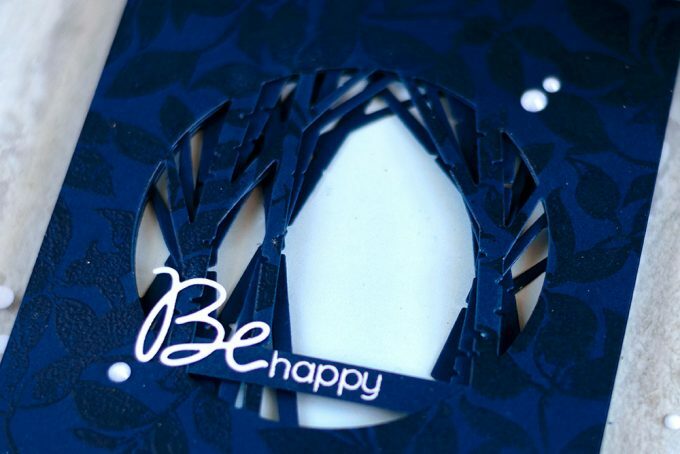 And of course after creating the previous card I ended up having all those negative die-cuts. I always have problems throwing away negative die-cuts. So I grabbed a white panel and foam mounted the Birch Circle negative shape onto it using those leftovers. This shape is very simple and it can be done just by simple eyeballing. My eyeballing capabilities are next to nothing so I personally used a die-cut of this die out of scrap paper as a guide. 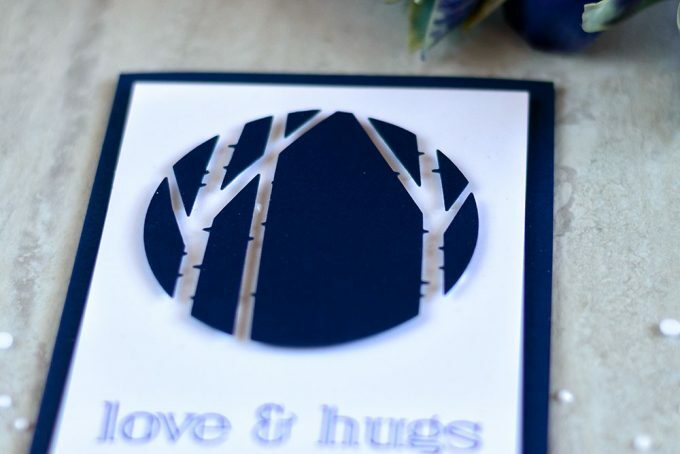 Next I stamped a sentiment from SSS Big Greetings Stamp Set below and foam mounted the panel onto a Navy card base. The third option of using this die is probably the first that comes to mind, at least nowadays – a shaker. 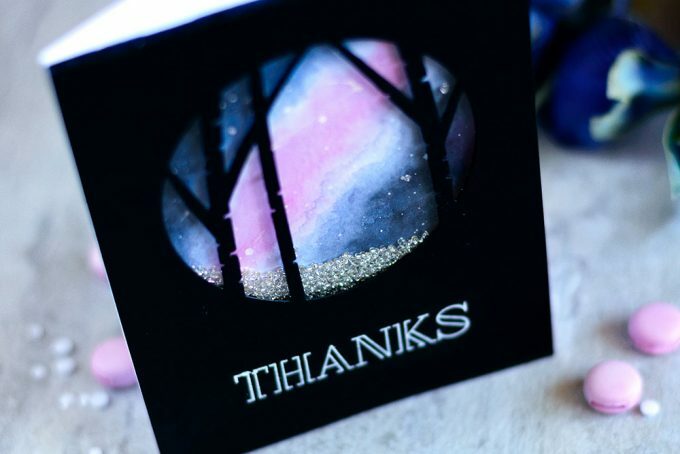 For the back part of the shaker I created a galaxy watercolor background and adhered it onto a card base. 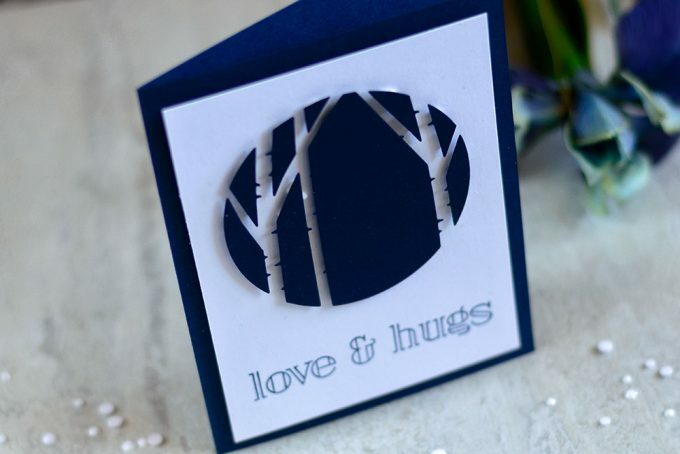 Next I die-cut Birch Circle out of black cardstock and white embossed a sentiment from SSS Big Greetings Stamp Set onto it. And then I assembled the shaker. I used black foam sheet to add dimension around the panel edges as well as the circle window edges. And I used very strong tape adhesive to adhered foam to paper as well as the plastic piece. Inside of the shaker I placed Silver Dust Beads. I like using beads in my shakers as they’re smaller and move easily inside. 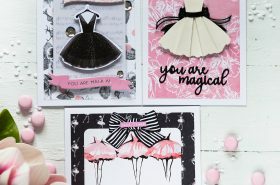 So here you have three ways you can use this wonderful die! WOW Svitlana, these are awesome! Love the tunnel card as it is unique and of course the shaker has my attention as well. 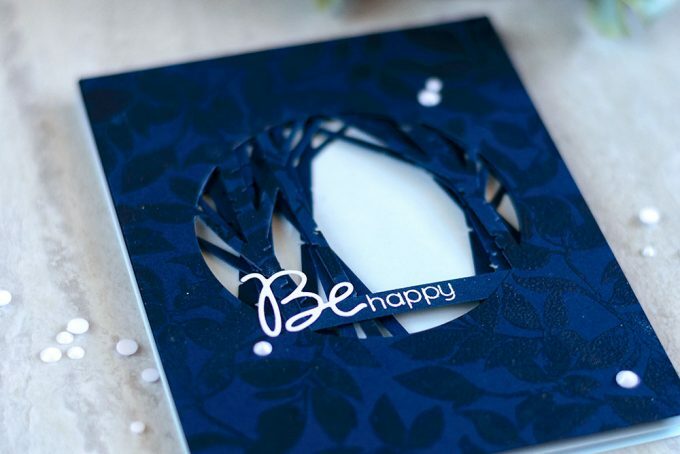 Love how you layered the die cuts to make it appear to tunnel…so creative! The other two cards are equally stunning. 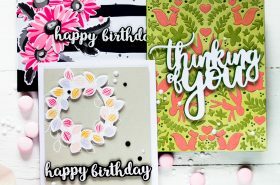 Your inked background in the shaker card is so beautiful! 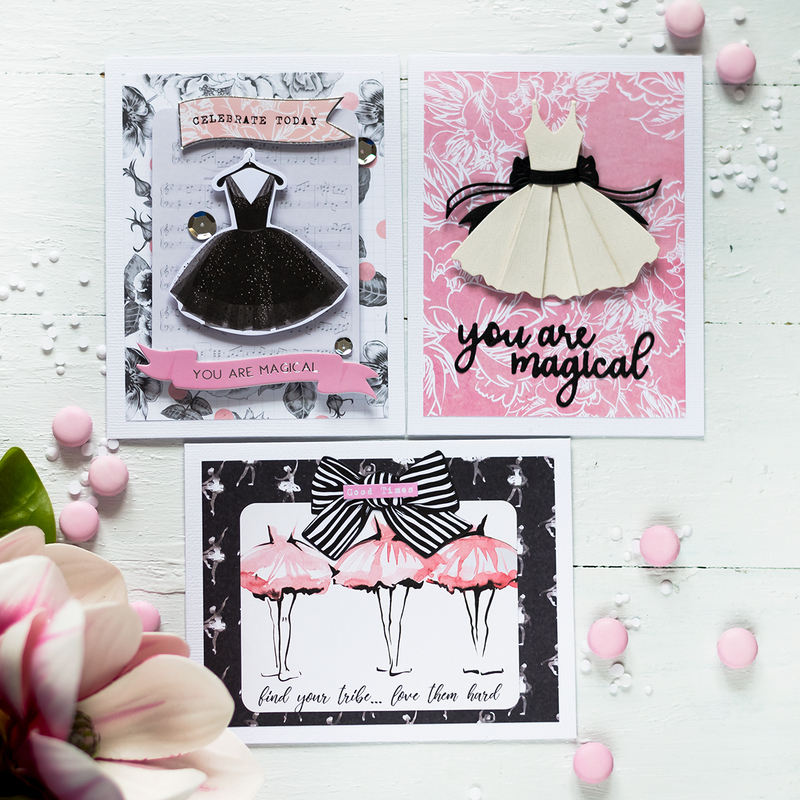 3 lovely cards featuring this die. My favourite is the shaker. The colourful background is striking against the black. 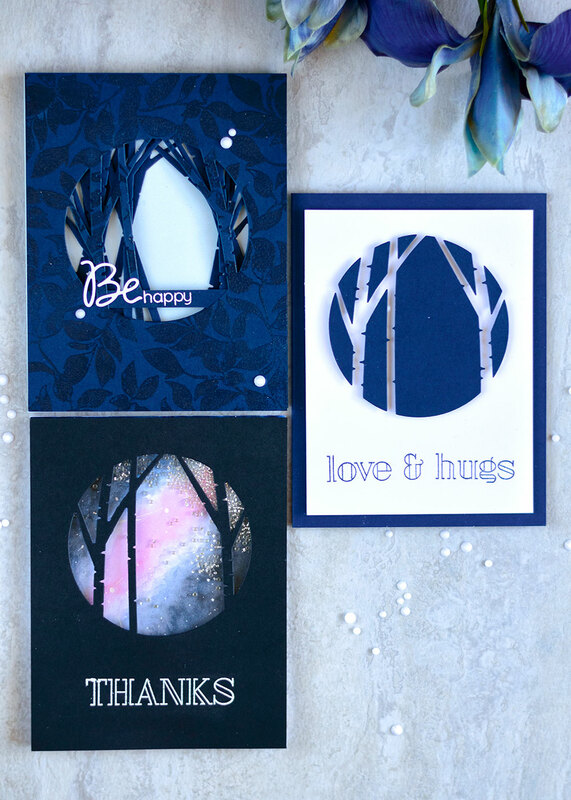 Love the birch circle die and the cards. 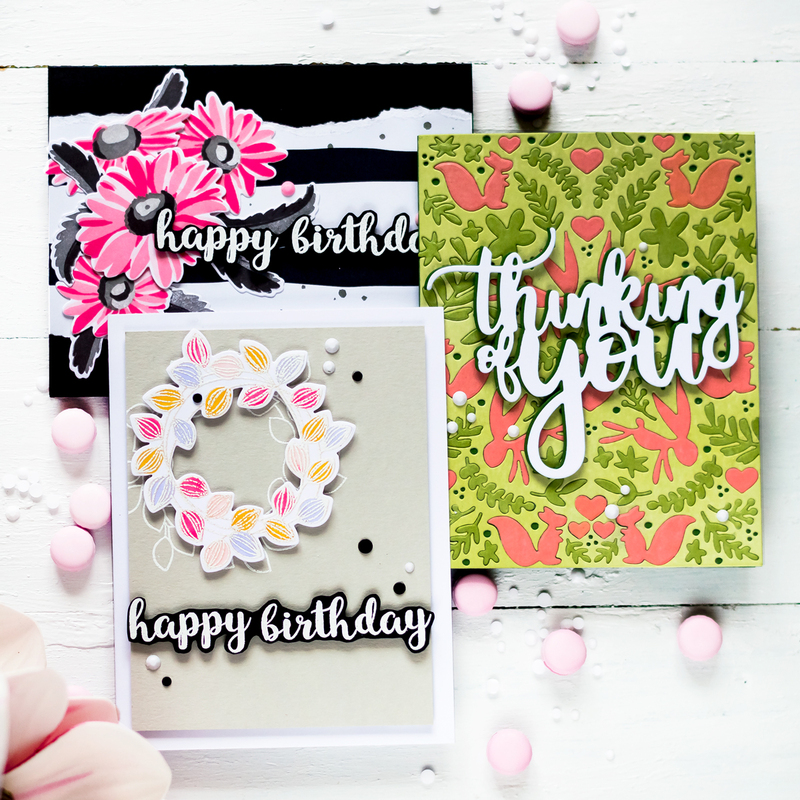 Such gorgeous cards with a wonderful die! !